For your health, it has many properties - anti-inflammatory, antibiotic - great in skin care. It's so easy to grow - you can root cuttings in water or sow seeds, grow indoors or out. I always say it's a great trainer herb as it's quick to grow, it wilts quickly when it needs water and you'll get to understand about pinching out and other useful outdoor and indoor gardening techniques. 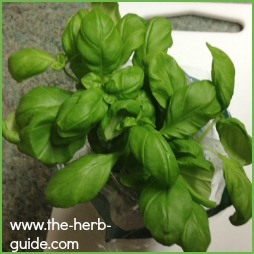 Read on to see some of the ways you'll be able to use basil - you won't be able to grow enough! 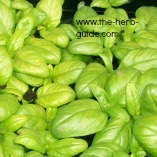 Issue #3 of Herb Guide News focussed on basil. 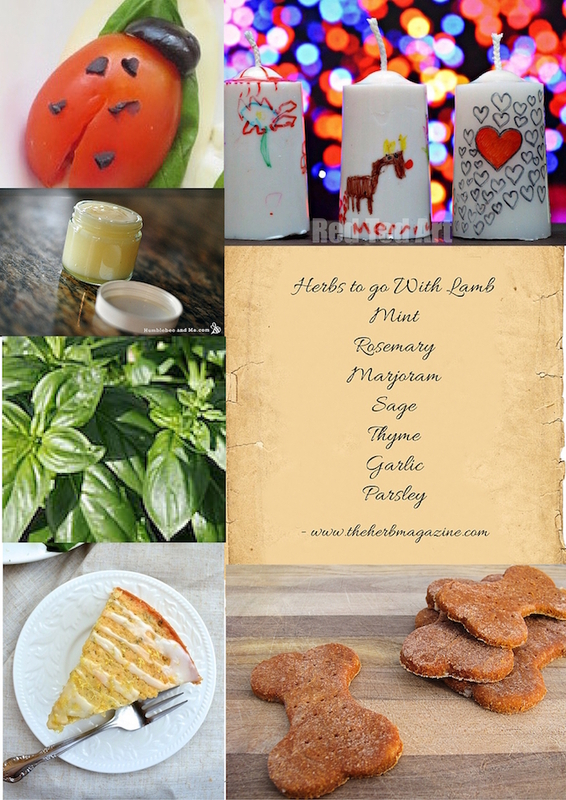 You'll find the Ladybug Caprese Salad, Lemon Basil Cake and Basil, basil face mask, toner and cleanser and Tomato dog treats amongst another dozen or so articles. Click on the photo to go through to read all about it. 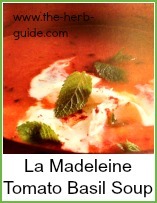 Sign up for the monthly magazine - it's online and free! 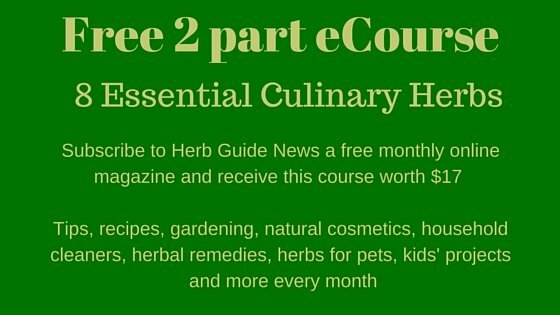 You also get a free eCourse '8 Essential Culinary Herbs' and yes, basil is included in that list! 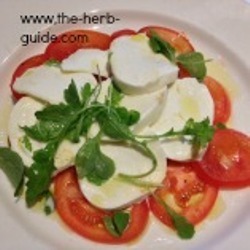 A more traditional presentation of Caprese Salad, but quickly made - great for a light lunch with some crusty bread served on the side and a nice glass of something cool and refreshing and maybe fizzy. 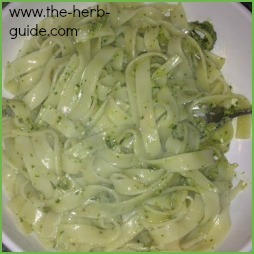 This is a classic basil pesto recipe served over tagliatelle. 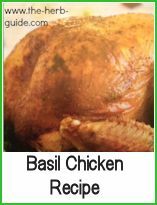 It is very easy to make and can be made using fresh or frozen basil - a little experiment I tried when I bought a marked down basil plant I saw in the supermarket. Freezing basil is really easy. This sad looking plant here was one I felt sorry for when it was in the reduced bin so I liberated it and brought it home :-) It made a great basil pesto and a tomato and basil soup. Instructions here for growing basil from seed either indoors or outdoors. It's a good idea to plant some basil round your sitting area or grow it by your windows to help repel mosquitos and other little critters that want to bite you. A quick tip is to pick a few leaves and rub them on your skin - the essential oils released will help protect you. Bear in mind, that not every herb works in the same way for everybody - so don't dismiss basil if you still get bitten. Try one of the other Herbs to Repel Mosquitos here or get Issue #5 of Herb Guide News which is focussed on natural bug repellants. The health benefits of basil are quite surprising. 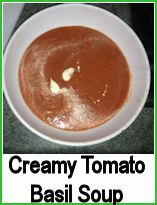 Something that is so versatile and tastes so good, can actually be beneficial - wow!. This article written by my friend Danny, outlines some of the great benefits you can get, telling you what minerals and vitamins it contains and how and why it can help you.